We’d love your help. 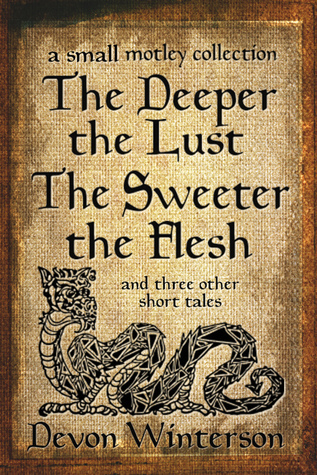 Let us know what’s wrong with this preview of The Deeper the Lust, The Sweeter the Flesh, and three other tales by Devon Winterson. A mishmash of four unrelated short tales where one man's lust becomes his fatal undoing, four squirrels tempt fate and death, a forest hike destroys an expensive camera, and the author deliberately abuses a host of cliche phrases. To ask other readers questions about The Deeper the Lust, The Sweeter the Flesh, and three other tales, please sign up. The Deeper the Lust, The Sweeter the Flesh is a pretty good collection of short stories, but they don't carry, for me anyway, the same emotional heft that the first collection by the author, Open Your Heart to Chance, did. This is not a fault of the author, though the two collections were each written for different reasons. Rather, it's one of my own personal faults as I'm detached from many things. That said, the story called My Jack! was pretty unusual and it did make me wonder what would happ The Deeper the Lust, The Sweeter the Flesh is a pretty good collection of short stories, but they don't carry, for me anyway, the same emotional heft that the first collection by the author, Open Your Heart to Chance, did. This is not a fault of the author, though the two collections were each written for different reasons. Rather, it's one of my own personal faults as I'm detached from many things. That said, the story called My Jack! was pretty unusual and it did make me wonder what would happen at the end. In addition, the first story, The Deeper the Lust, The Sweeter the Flesh, also had a surprise ending. A wickedly dark title story, followed by a impish collection of short and twisty tales that you just know the author had as much fun writing as you'll have reading. This is a perfect collection for downloading on a rainy day and curling up in a comfy chair to read, with a large mug of tea for company. A wholly entertaining and enjoyable collection if ever there was! Kimberly Grenfell (a.k.a. Devon Winterson) has been an avid reader of fantasy books since childhood, and has studied creative writing and editing both on her own and through college and independent classes. Since 2008, she has been a line editor, a contributing editor, and an art director for Writer's Beat Quarterly, a free online magazine for The Writer's Beat writing community. Kimberly has contr Kimberly Grenfell (a.k.a. Devon Winterson) has been an avid reader of fantasy books since childhood, and has studied creative writing and editing both on her own and through college and independent classes. Since 2008, she has been a line editor, a contributing editor, and an art director for Writer's Beat Quarterly, a free online magazine for The Writer's Beat writing community. Kimberly has contributed several articles to this e-zine under the regular features "New Writer on the Beat" and "Mechanical Snippets" to help novice writers understand and master the craft of writing and its mechanics. She has also served as an acquisitions editor and line editor at a small publishing company for two years. Currently, Kimberly has a collection of five full-length novels (in progress) and one novella (also in progress) based in the fictional world of Caendoria, as well as a humorous middle grade novel co-written and co-edited with her son (yes, in progress, as well), and a handful of free "penny fiction" pieces soon available for download on Smashwords - all creations through which she has been able to apply what she's learned in her various studies.